This evening Leif, the kids and I decided to venture out to try the new burger joint that just opened on Lake Street. 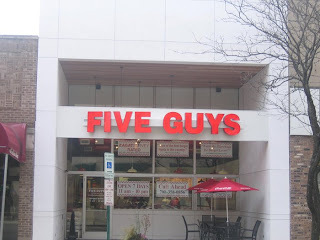 Five Guys is well known on the east coast for their fresh made beef burgers and fries made from fresh cut potatoes and the arrival of the restaurant has been much anticipated in Oak Park. 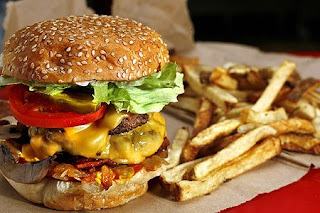 For goodness sake there are more than 250,000 possible burger combinations at Five Guys so critics of the "limited menu" just need to chill! I am not going to lie...the burger is a sloppy mess of gluttony and I loved every bite. I didn't realize a regular burger is a double; in the future I would order the the single "little" burger. The portions are out of control big. Our fries were delicious (the potatoes came from Sugar City, Idaho), but I would have ordered one large to share between the four of us. The Elsmo four will certainly return to Five Guys...four thumbs up! From the restaurant we strolled over to the Lake to watch Bedtime Stories with Adam Sandler. The movie was delightful and also received four thumbs up! All in all it was a great family night. Happy New Year!! I LOVE Emma's hair cut. I need to stop reading your blog around dinner time... everything I had on the docket is going to be a letdown after looking at your New Year's spreads, haha.